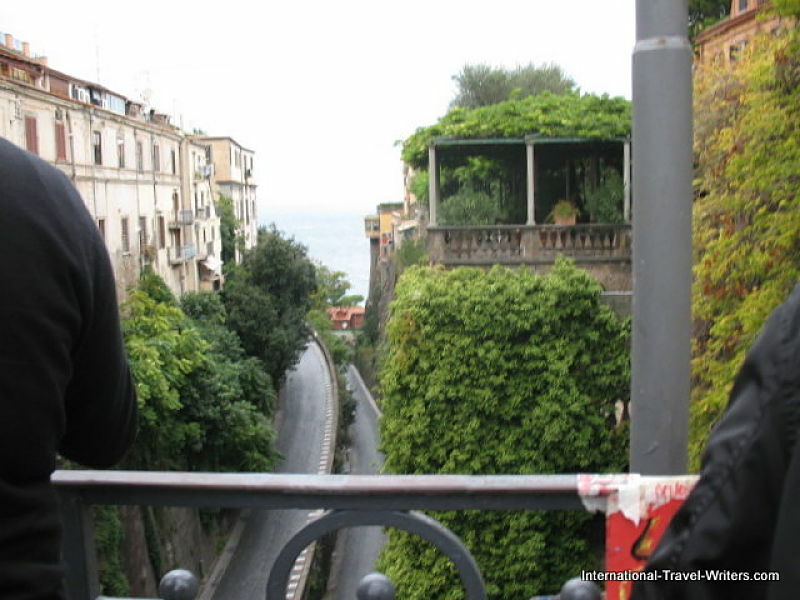 Sorrento, a small, captivating town in southern Italy, was to be our lunch stop. 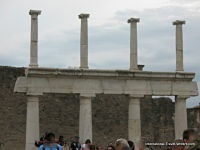 We had toured the fabulous ruins of Pompeii and our tour was continuing to the Isle of Capri after the meal break. 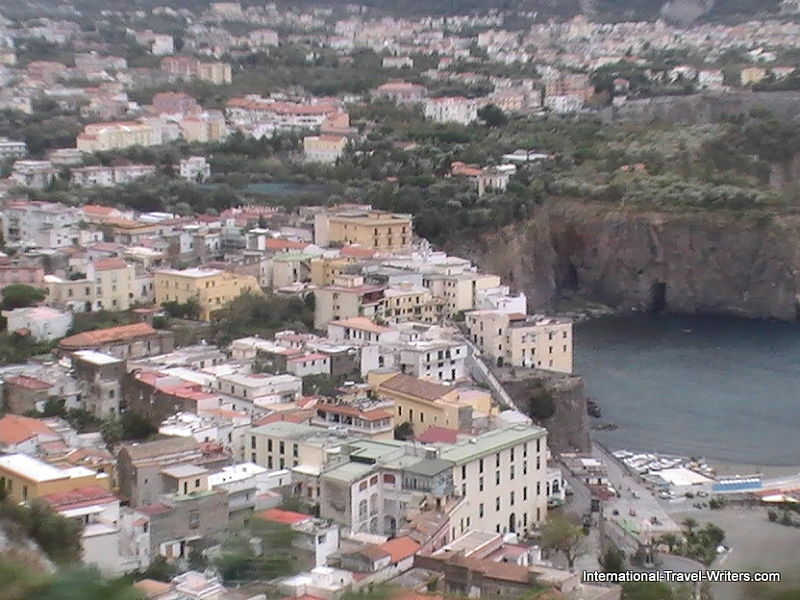 This charming town was only an hour away from Naples where our cruise ship was docked. It was easy to see why this scenic region was included in the "Grand Tour", a sort of a "rite of passage" performed by wealthy young men (usually of unlimited funds) during the 1700's and 1800's in order to expand their knowledge by exposure to the cultural importance of specific works of art, music and classical antiquities contained within Italy and other European centers. 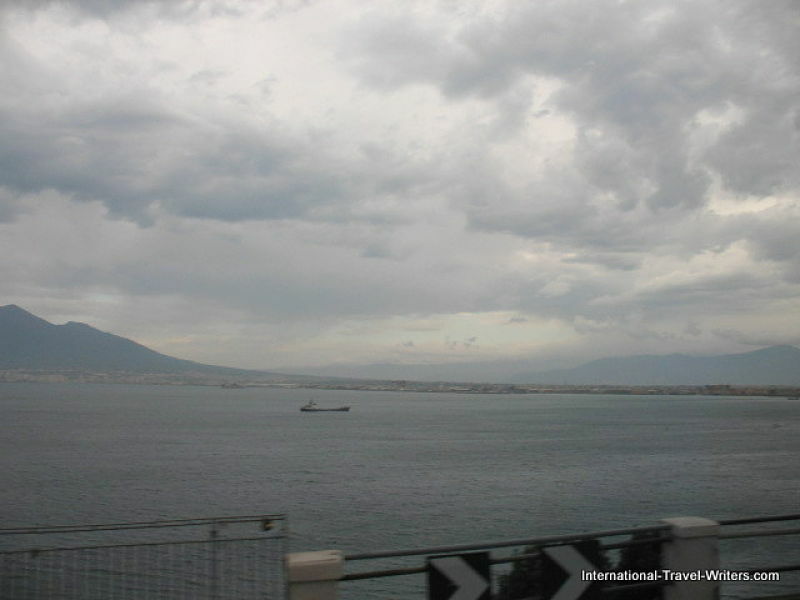 Unfortunately, the weather wasn't being cooperative and the normally gorgeous views across the water to Vesuvius were rather gloomy and forbidding. We'd even had a few sprinkles dampen our clothing as we exited Pompeii but our spirits were bright, making up for the lack of sunlight. New places, no matter what the weather throws at you, lights that spark of curiosity that energizes travelers similar to us. At least we could imagine what a warm and sunny day would look like because the terrain still held some interest with its natural curves that somewhat simulated the crazy curving road above that we travelled upon. Our driver obviously knew the road to Sorrento well because although we were covering a lot of turf at a fast clip there wasn't much movement in the bus through the twists and turns in the road...and they were numerous. 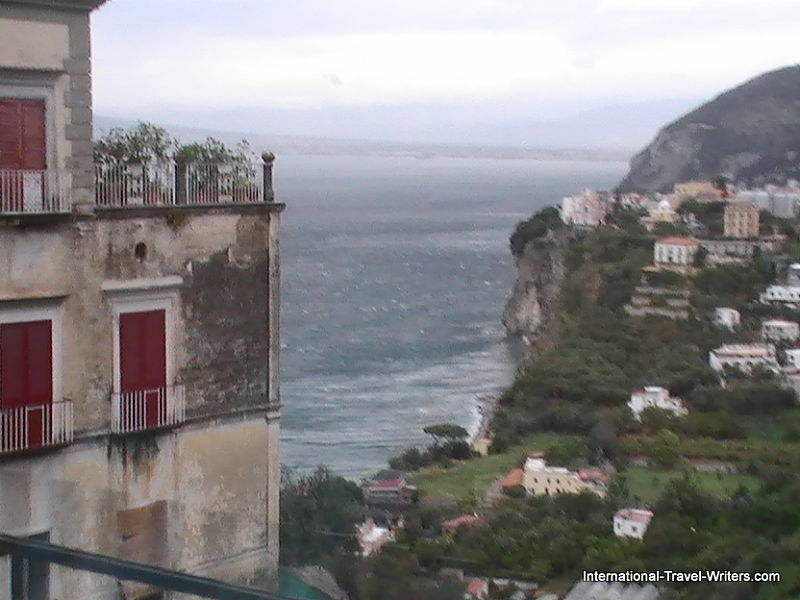 Sorrento is on the Mediterranean overlooking the Bay of Naples. There are even locations where you can actually view Naples, Mt. 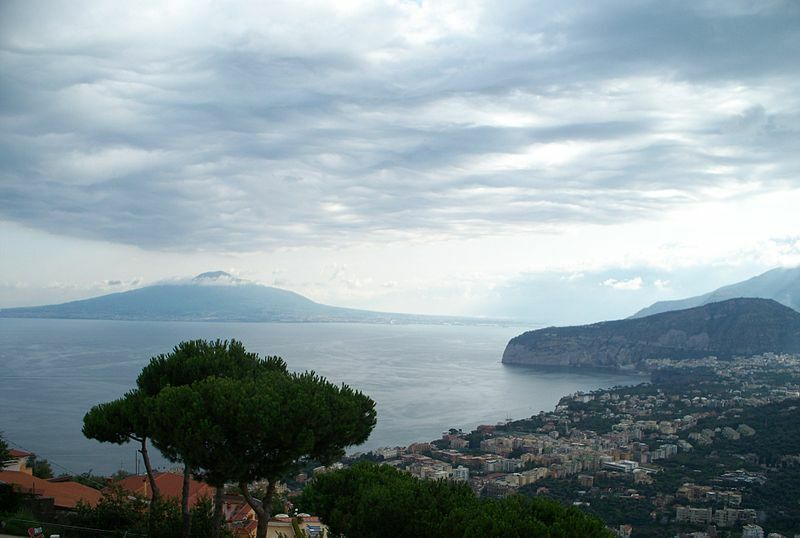 Vesuvius and Capri. 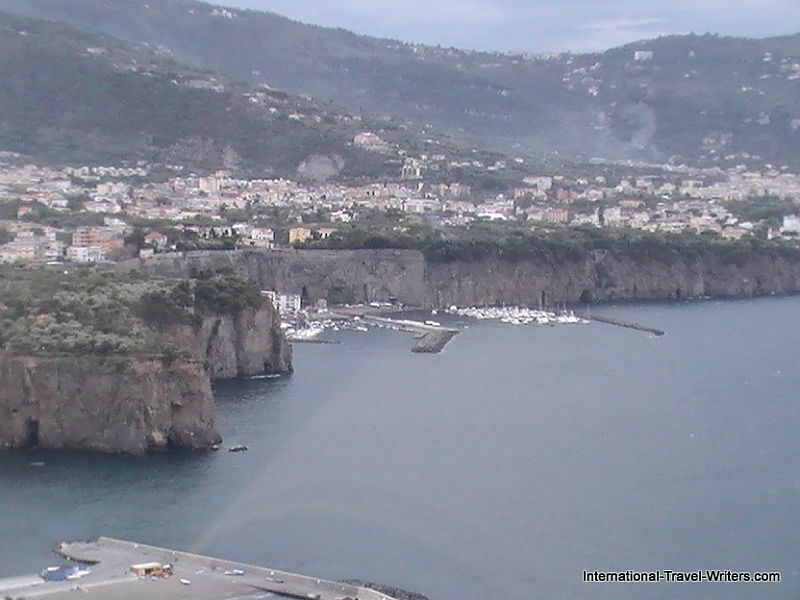 There is regular ferry service to Naples and other areas such as Positano, Capri, Amalfi and Ischia. 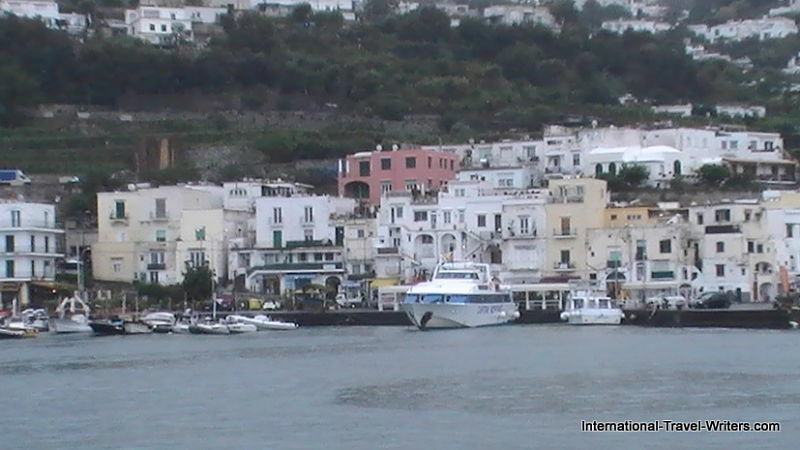 Hydrofoil service is also available to some areas such as Capri which was on our agenda. 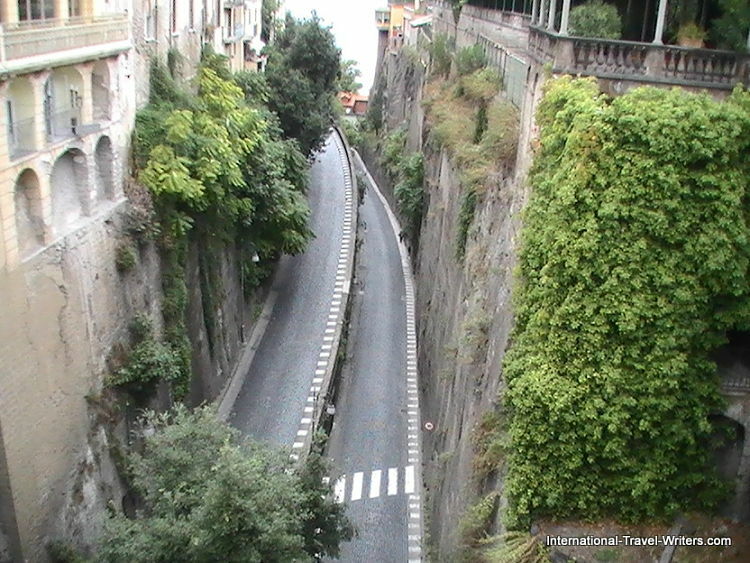 The Bay of Naples has numerous cliffs. 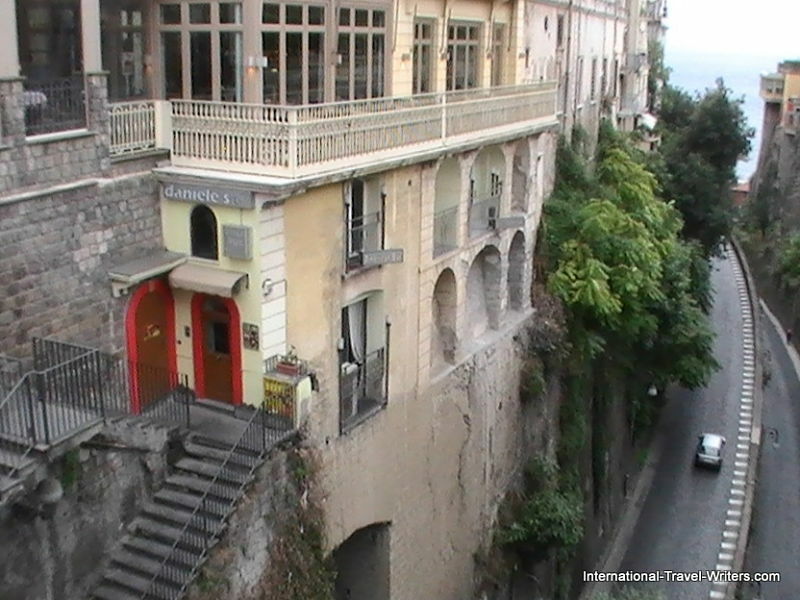 Many of the populated areas had homes and small hotels built down the hillsides, a few looking like they were clinging precariously. 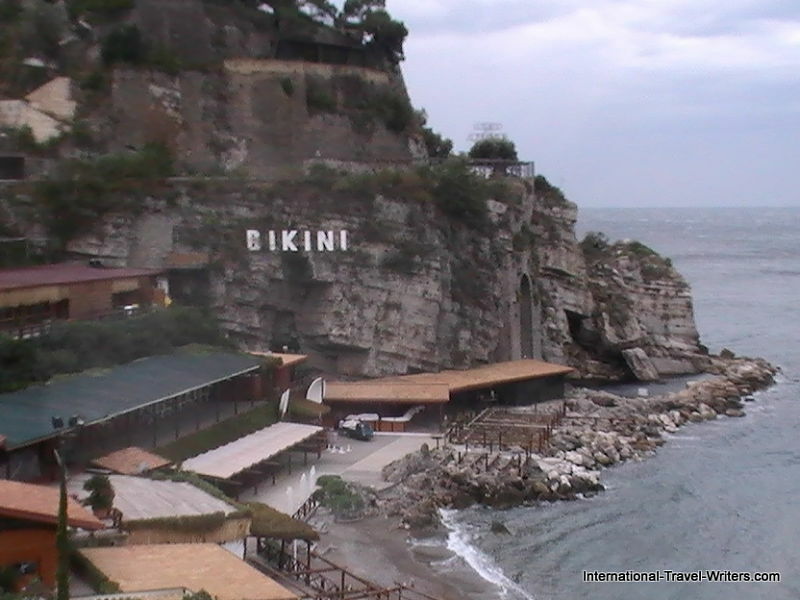 At the bottom of some of the cliffs there were small beaches, restaurants and bars. 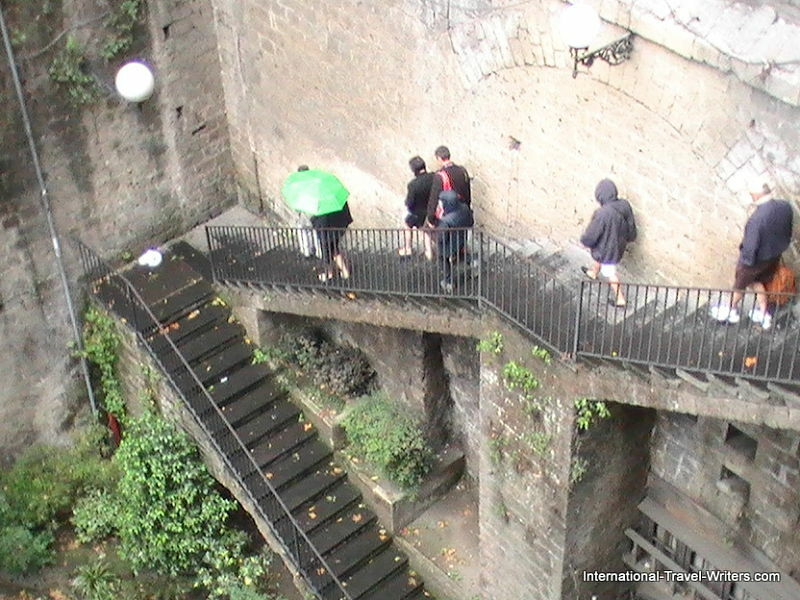 Although there was no hillside transportation visible there must have been stairs leading down to the sea. 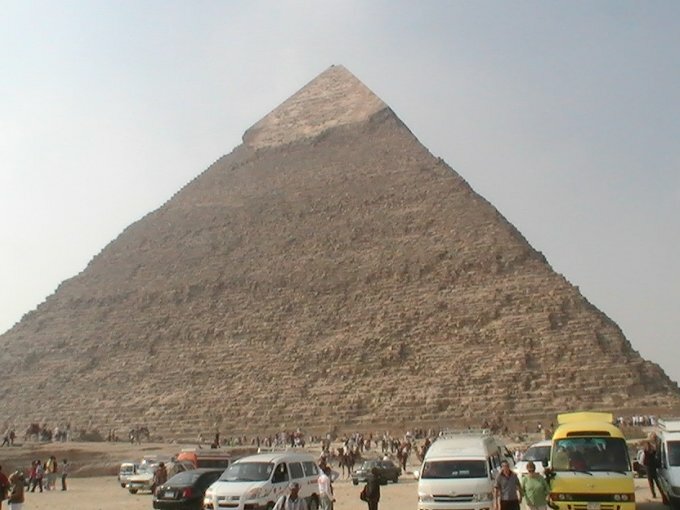 Don't know that I'd want to hike it back up once the descent had been made. The heavier populations were along the top of the terraced cliffs with some staggering views. 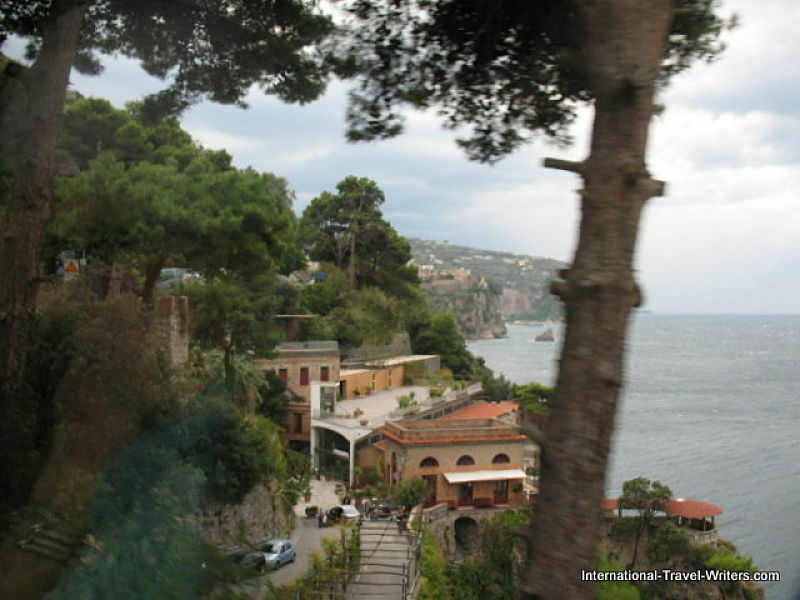 Sorrento actually has around 20,000 inhabitants and it sits at the south-eastern end of the Circumvesuviana rail line so it can be reached by train from Naples if you choose to travel in that manner. 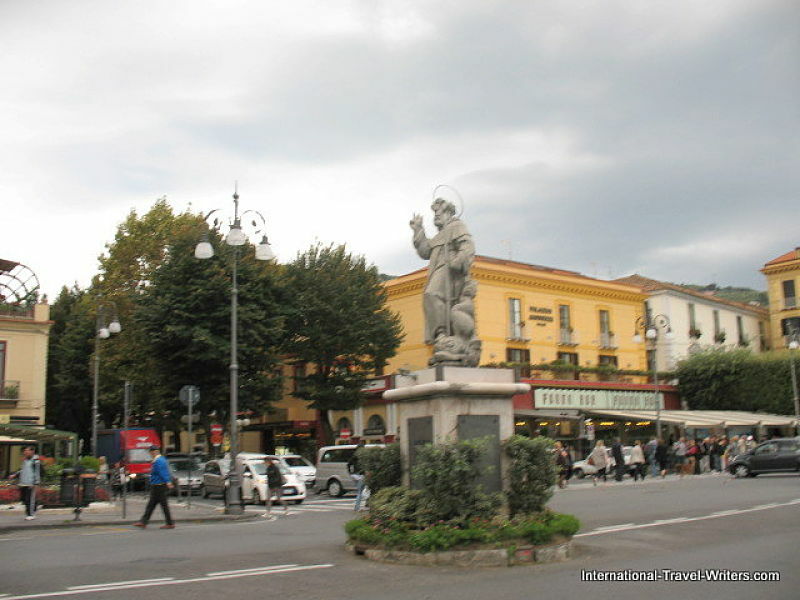 There is a huge statue of Saint Antonino in the main town square of Sorrento. He died in 625 AD and he was known as an abbot, hermit and a saint. He left his home in Campagna to become a monk at Monte Cassino but when it was invaded by the Lombards he returned. He eventually served as the town's bishop and patron. 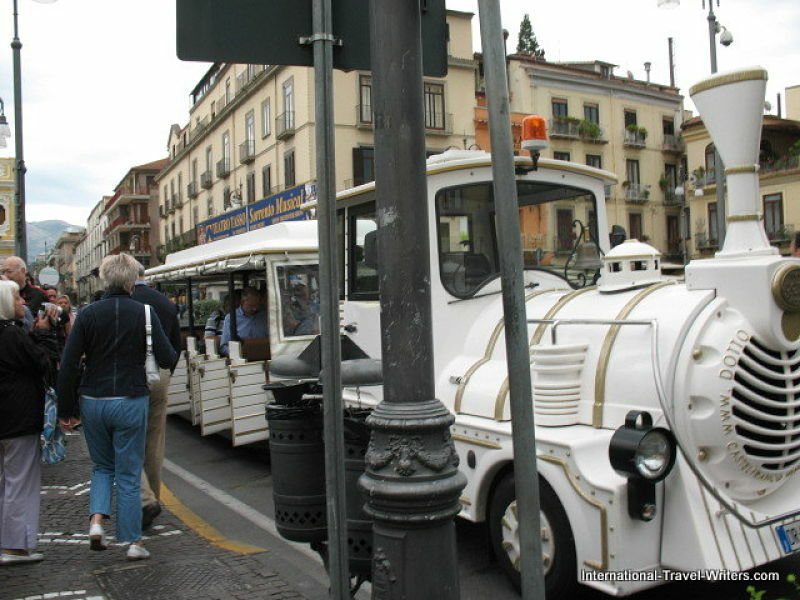 There is a local tourist "jump on/off" vehicle that resembles a train pulling a trolley carriage. 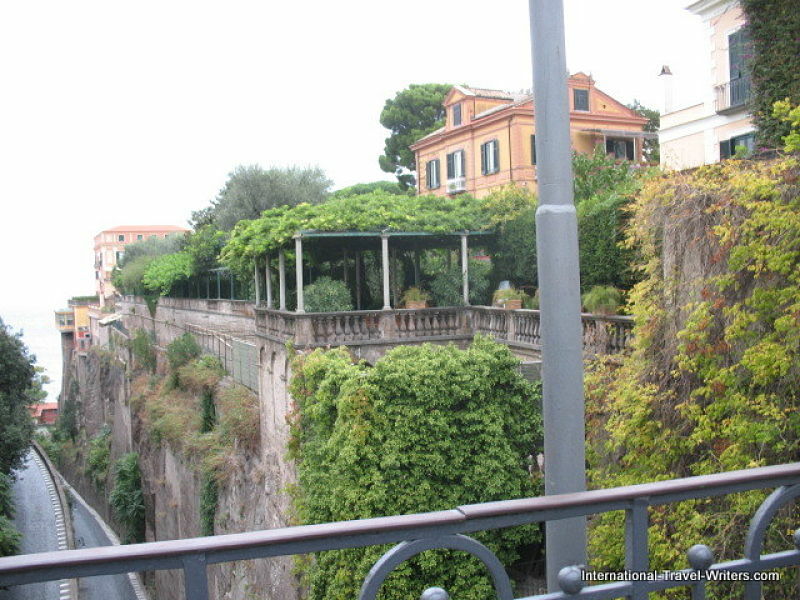 It has a short, specific route that winds around the major arteries off of the main town square. It's a cute Disney-like type of transportation that we saw myriads of folks utilizing. 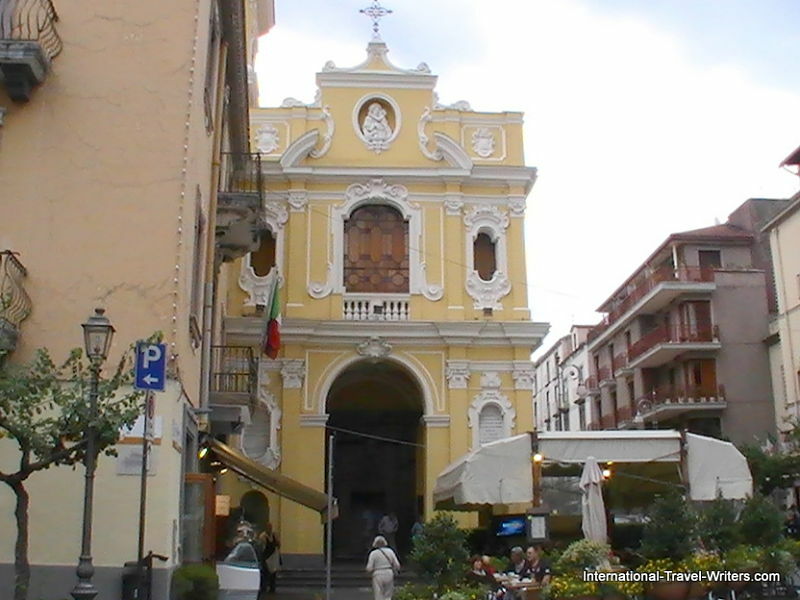 The church of Santa Maria del Carmine was perched prominently in the main square of the town. It was a former medieval church and the newer façade that dated back to the 1700's. The hour of free time to wander the city prior to lunch was to conclude by meeting at the Palazzo Jannuzzi (seen above). The hotel, Palazzo Jannuzzi Relais operated atop the Jannuzzi family's art and furniture shop that had superb examples of inlaid woods, magnificent embroideries and potteries. 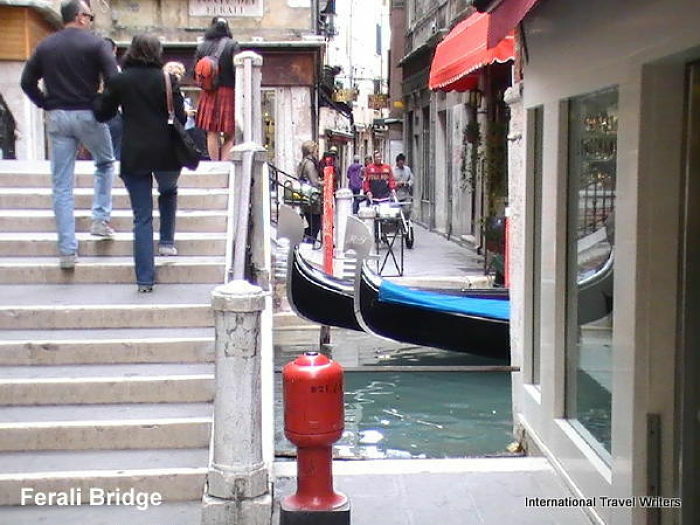 We got so involved in marveling at the artistic works that it was difficult to leave on time. 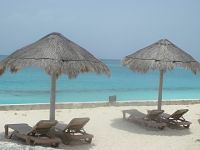 Although Palazzo Jannuzzi opened in 1852. the hotel was renovated and updated in 2011. 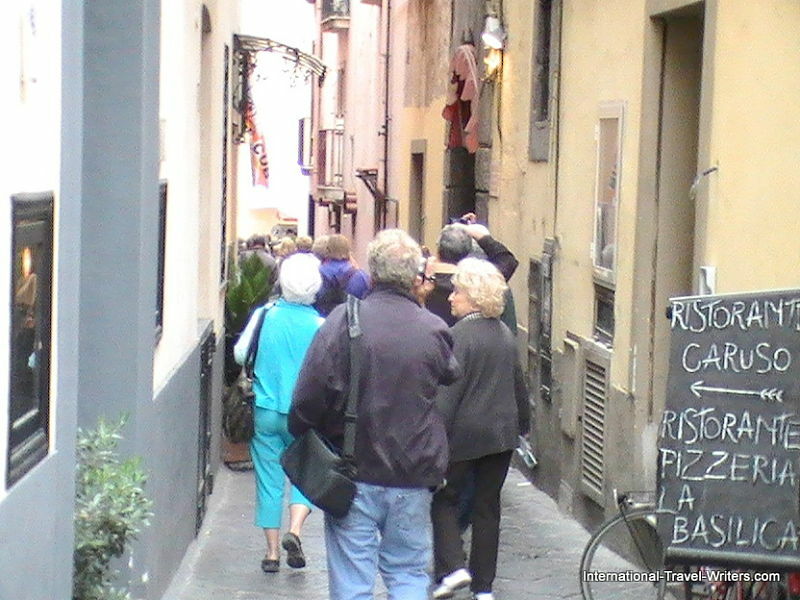 We had to walk down a narrow street to access the lunch spot, Ristorante Pizzeria La Basilica. The food turned out to be very good Sorrentine fare. 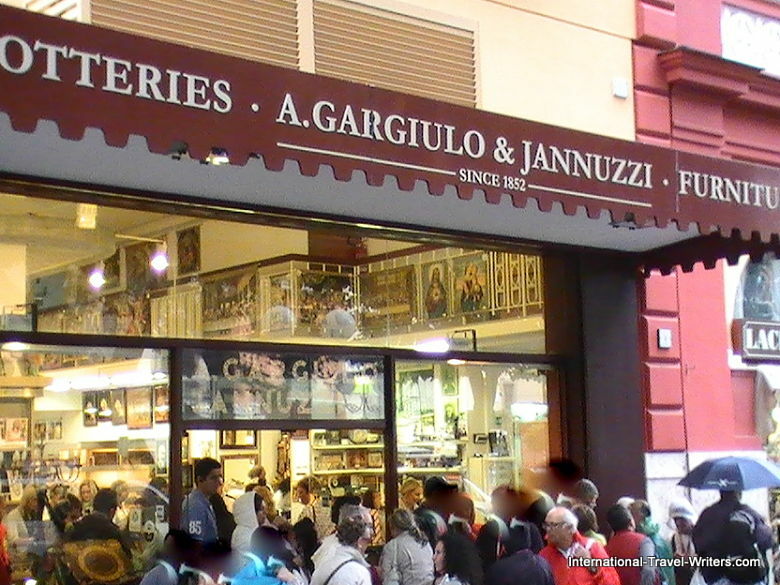 The service was surprisingly fast considering the large group of us that they were accommodating in one fell swoop. 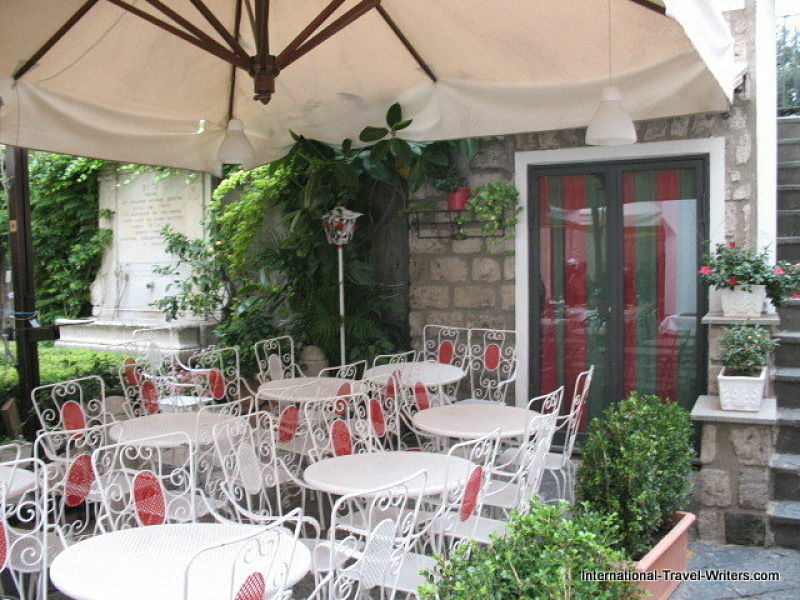 The Ristorante had outdoor tables available but the result of the rather damp and overcast day was that the tables sat empty. 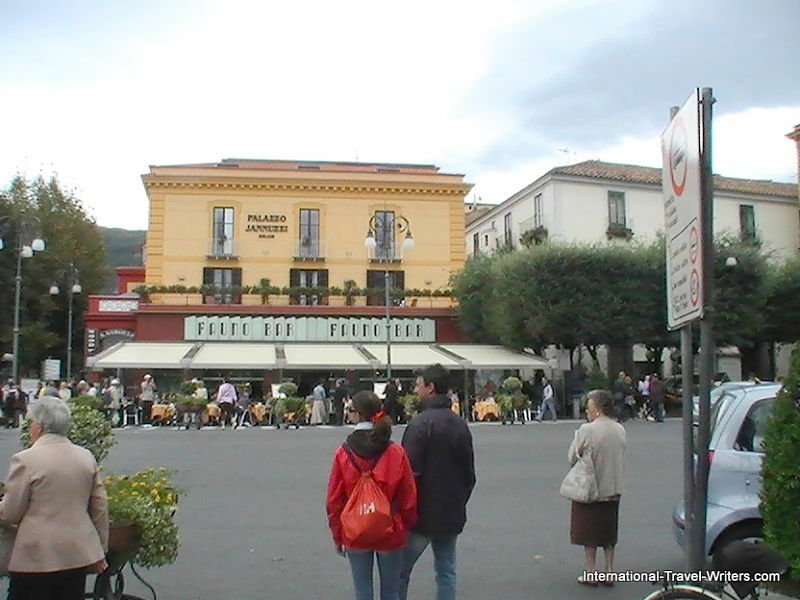 These next few photos were taken from Piazza Tasso Square. 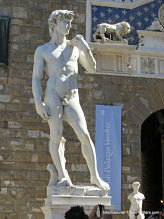 The Piazza is named for Torquato Tasso, an Italian poet and writer from the late Renaissance era. 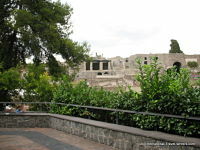 The square was created in 1800 when they replaced aged fortifications that had occupied the site since the 1500's. 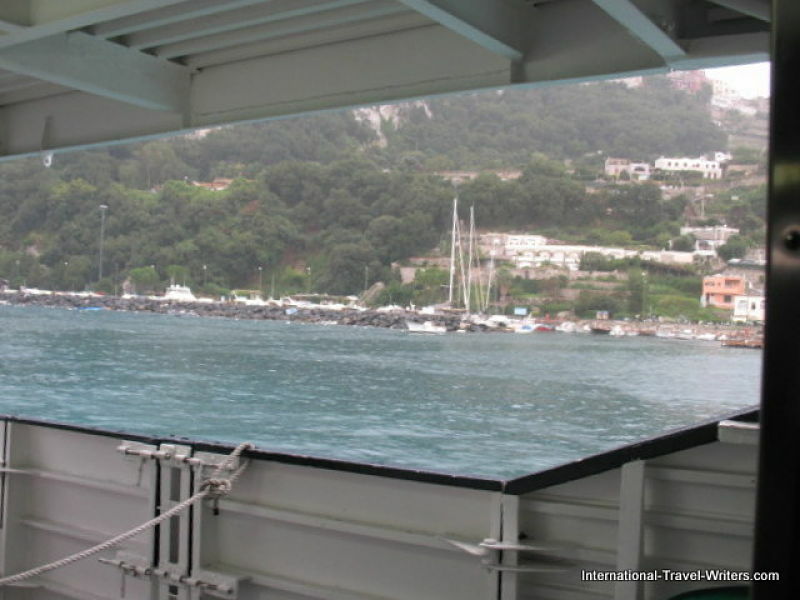 From our point at the edge we could look down the path we had to walk to get to the sea to board our boat to Capri. 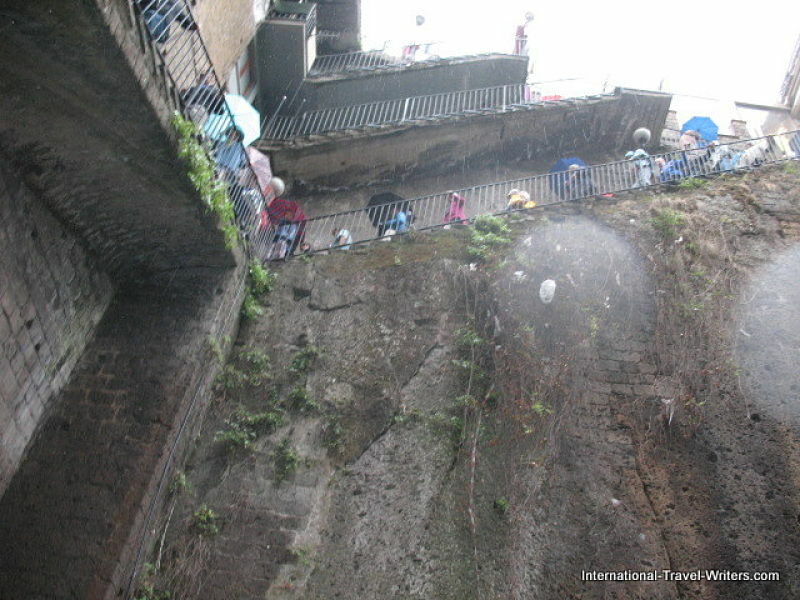 The long path below would be reached by descending stairs down the side of the building that are shown in photos below. Once we were partway down the stairs I was able to turn the camera upwards to catch a few shots of the walls and then as seen below, stairs and more stairs. At least we were going downward and not climbing up. Apparently there are two elevators that connect the city center to the port of Marina Piccola and the beaches but we were "hoofing it". 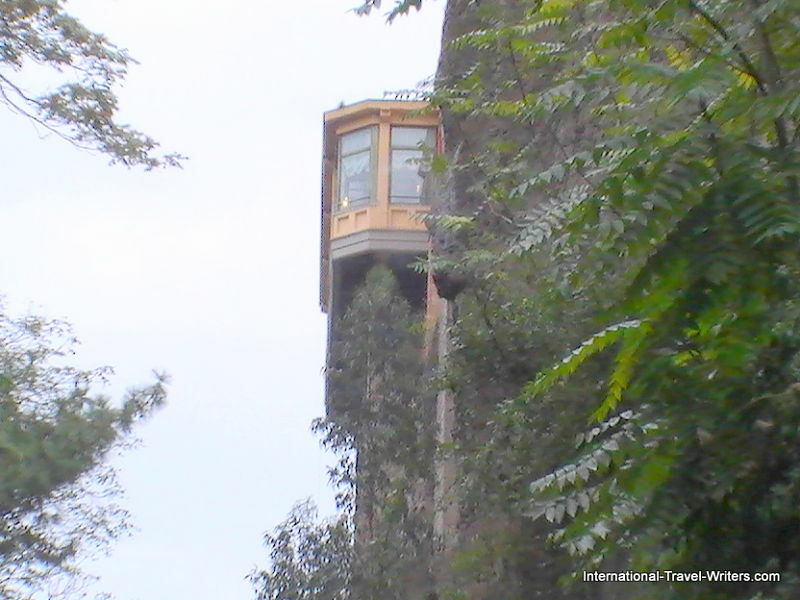 However, after the long, strenuous hike down the staircases and winding precipice road to board the hydrofoil that would deliver us to Capri...my suggestion for those not having the time restraints of returning to a ship at a specific time would be to take a hydrofoil directly from Naples to Capri...or to use one of the elevators from the city center. 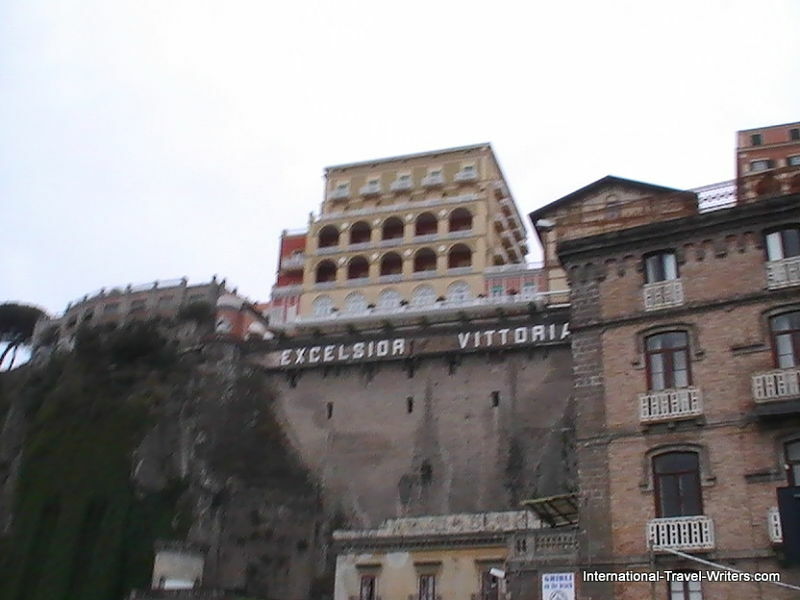 Once we reached Marina Piccola where our hydrofoil transport to Capri awaited, glancing upward we could see the Grand Excelsior Vittoria Hotel, a 5 star distinguished hotel that enjoys a lofty, clifftop position over Sorrento. 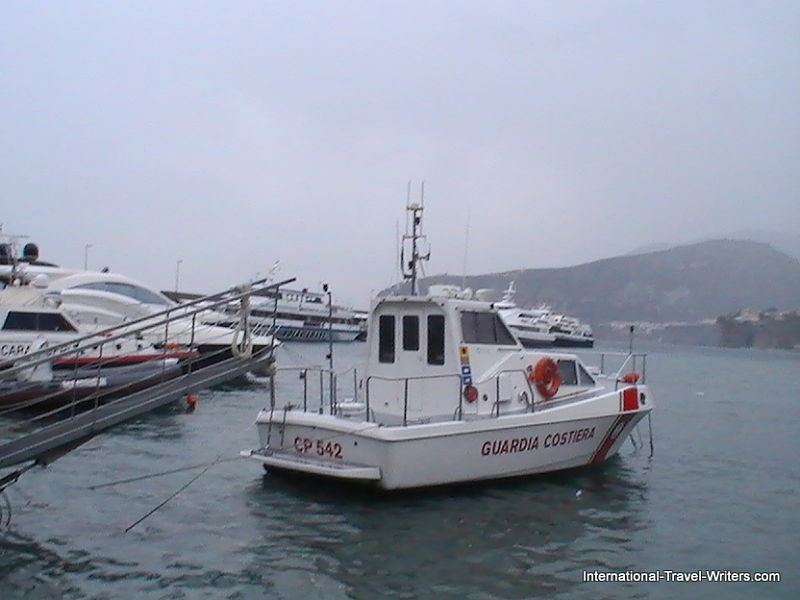 The Italian Coast Guard has a few smaller boats to supervise the marinas. 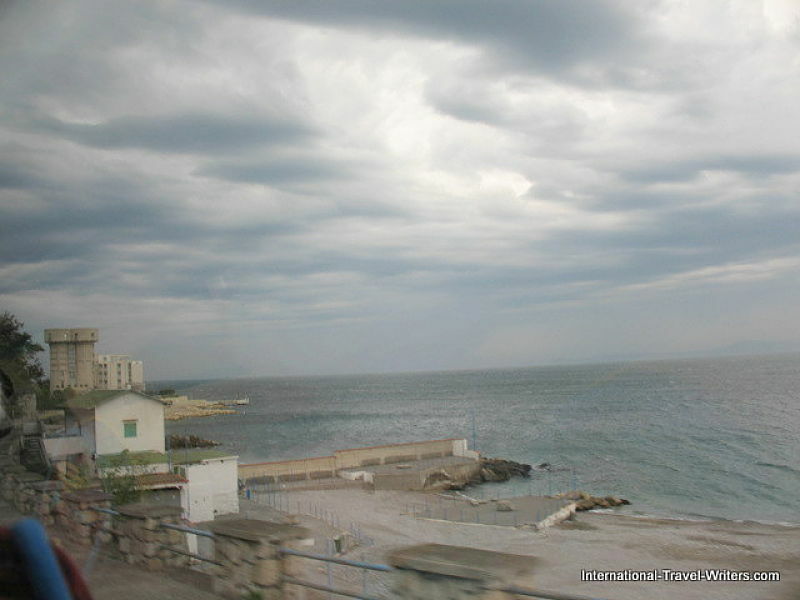 Once onboard the hydrofoil we took just a couple of shots because the winds had intensified. We were off to Capri.